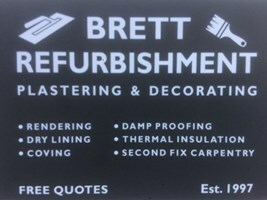 Brett Refurbishment - Plasterer based in Burwash, East Sussex. My name is Jonathon Brett of Brett Refurbishment. I have 22 years of experience in my trade and have always taken great pride in my work to give a high quality standard of finish. I offer a clean, reliable and friendly service. I’m fully insured and give free quotes and advice.